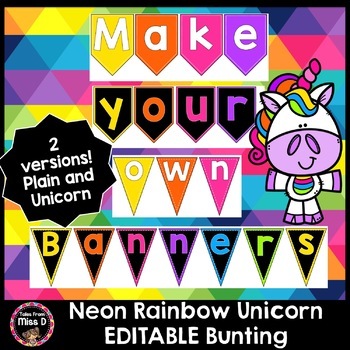 This Editable Bunting pack contains MULTIPLE colours and designs for you to create a variety of headers for classroom displays and bulletin boards. This file is EDITABLE meaning you can make it your own. Customise the font, font size, font colour and effects. Duplicate pages to create more bunting as needed. Love the colours? Check out my Neon Rainbow range here.